How well a flu shot protects you from the virus can depend on your ethnic background and other inherited factors, report Dana-Farber Cancer Institute scientists. The researchers, led by Wayne Marasco, MD, PhD, a cancer immunologist and virologist at Dana-Farber, found unexpected ethnicity influences on genetic variation in a key immune system gene that generates antibodies that can recognize and ward off the common influenza A virus. The results could lead to new tools for predicting how different individuals and populations will respond to influenza vaccines, according to a report in the Nature journal, Scientific Reports. Additionally, the authors said, these insights will be important in ongoing efforts to develop "universal" vaccines that would provide multi-year protection against a wide variety of flu strains. "This will change our understanding of how to achieve universal vaccine responsiveness in a population," Marasco said. The study focused on variations in IGHV1-69, one of about 50 human genes carrying the instructions for making millions of protein antibodies to fight infections. The antibodies patrol the body and recognize identifying molecules on the surface of virus particles, then summoning "neutralizing" antibodies to block them. Antibodies generated by the IGHV1-69 gene could be useful in developing universal flu vaccines. That's because these antibodies bind to the "stem" of a lollipop-shaped protein, hemagglutinin, on the flu virus' surface. 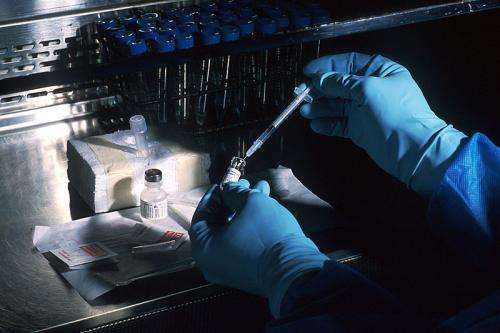 Current vaccines largely cause the immune system to recognize the "head" of the hemagglutinin protein, but the flu virus rapidly shape-shifts this region from year to year to escape the vaccine. The stem, however, is less susceptible to change - and designing vaccines that makes better use of the IGHV1-69 genes should lead the body to make these types of stem antibodies that someday might offer long-term protection against many flu strains. The IGHV1-69 gene is highly polymorphic and exists in 14 slightly different forms: each person inherits two of these variant forms, one from each parent. Some versions of the gene are more effective than others at mounting a response to the flu virus - or to a vaccine made to mimic part of the virus. And about 15-20 percent of people don't actually carry the effective versions of this gene to make antibodies to the virus - they use some other genes that scientists haven't yet fully identified. That's one of the likely reasons why current vaccines are far less than 100 percent effective, Marasco explained. The scientists studied stored blood samples from volunteers who received a vaccine against the H5N1flu virus in 2007. They found that in test tube experiments the strength of the individual's immune response varied significantly according to which version of the IGHV1-69 gene they carried, and also how many copies of the genes were present. And they used other data to show that the frequency of different versions of the IGHV1-69 gene varied dramatically among three broad ethnic groups - African, Asian, and European. The scientists say it is the first report to link variations of the gene with ethnic background. In light of these new findings, the authors suggested that scientists should build a complete catalogue of variations of all 50 antibody genes including the IGHV1-69 gene and map them to populations across the globe. This region of the human genome has been deemed too complex to sequence using current next-generation DNA sequencing tools. However, doing so could prove useful for predicting vaccine responsiveness at the individual and population level. In addition, they said, the effort "will be particularly important for the development and monitoring of the next-generation 'universal' influenza vaccines" that are directed to the hemagglutinin stem region.